James Sooy and Oliver Gibson have come up with Pierced Glasses - the most minimalist eyewear since the Pince-nez was invented in the 1840's. Attach rare earth magnets to the glasses; these hold the glasses on. Don't get rid of the bridge pieces; they let the lenses sit on your nose and take the actual weight of the lenses. My favorite extreme eyewear from science fiction are Molly's surgically inset glasses from William Gibson's 1984 novel Neuromancer. The glasses consisted of the lenses only, which were implanted so as to seal off her eye sockets completely. Her tearducts were rerouted to empty into her throat, as I recall. 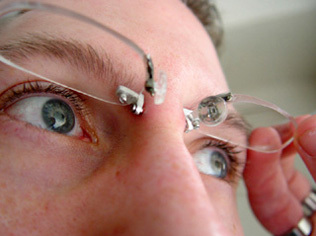 Read more about pierced eyeglasses; visit the pierced glasses page. Also, for a possible co-invention credit, see the entry for Pierced Sunglasses at Halfbakery.